Within three years of coming to power, Bonaparte completely reorganized France. He set in place a strong, centralized government with a tightly structured bureaucracy. He built new parks, bridges and quays along the Seine, as well as canals, reservoirs, and roads. He founded the Bank of France, which assured French businessmen credit at a reasonable rate. Slowly the economy revived, and prosperity returned to France. All of Europe was in awe. In 1801, Bonaparte signed an agreement with the Pope - the Concordat  making Catholicism the official religion of France. He had no personal use for religion, but he understood its political value. Bonaparte signed the Treaty of Mortefontaine with the Unites States, and sold the Louisiana Territory to the Thomas Jeffersons government. In March 1802, he convinced England to sign the Treaty of Amiens, temporarily ending their war against France. He oversaw the codification of a new system of laws  the Civil Code  which abolished feudal privileges and established the equality of every man before the law. JOURQUIN:The rights and duties of citizens  thats an invention of the revolution. But they were not codified in a central text. It was necessary that these rights and duties become the basis for a grand legal system for the society to function effectively. He forced the nations he had conquered to accept the new laws he had created for France, undermining the centuries-old foundations of European civilization. The monarchs of Europe arrayed their armies against Bonaparte. But time and time again, Austrian, Russian, and Prussian troops were defeated by the citizen-soldiers of the French Republic. 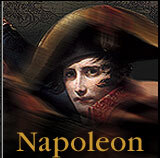 Bonaparte felt that he embodied the spirit of the Revolution through his rule. But had no patience with those who demanded greater liberty. He crushed those who spoke out against him, making a sham of parliament and free elections. CONNELLY: Napoleon believed in government for the people but not by the people. He took the French back to what they probably wanted at the time, which was a friendly monarchy, a benevolent monarchy, or at least it gave the appearance of being benevolent. In May 1802, Bonaparte amended the Constitution to grant himself the title First Consul for Life, with near dictatorial powers - a king in all but name. But he wasnt satisfied. WOLOCH: The more power that Bonaparte gets, the more he wants. And it escalates step by step. Never too much at once, always step by step, gradually and always with Napoleon looking back and saying, remember I am going to protect the gains of the revolution, theyre safe with me. "I had been nourished by reflecting on liberty," Bonaparte said, "but I thrust it aside when it obstructed my path." By late 1803, he path was clear. He wanted a crown, to be recognized on the same footing as the monarchs of Europe. 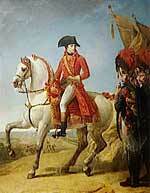 Bonaparte would make himself Emperor of France.